High quality leather carrying case with front label "Interunfall RAS"
Condition Excellent! The back shows a few scratches from normal wear. Batteries 3x AA or DC power supply. The power supply will feed the connecetd TI-74 as well. Comments Looking at the connector it seems that this printer works with the TI-95 Procalc as well. Accessories Manual: TI-74 Mathematics Library Guidebook (English), dated 1985, 1986, approx. 125 pages, PDF. The math functions can be used in an interactive way or they can be called from BASIC programs. However, some functions (ie. prime factors) only display the results but don't return them to the calling BASIC program! A very capable Pascal interpreter. Note: To initialize the Pascal subsystem enter run "pascal". There is no mentioning of this in the Reference manual - however, it is noted in the Learn Pascal User's Guide on pg. 10. Unfortunately, the keyboard overlay is missing. See keyboard shortcuts. A picture of the keyboard overlay can be seen here. In calculator mode 10 registers 0-9. Apparently, accessories are still available at High Tech Solutions. 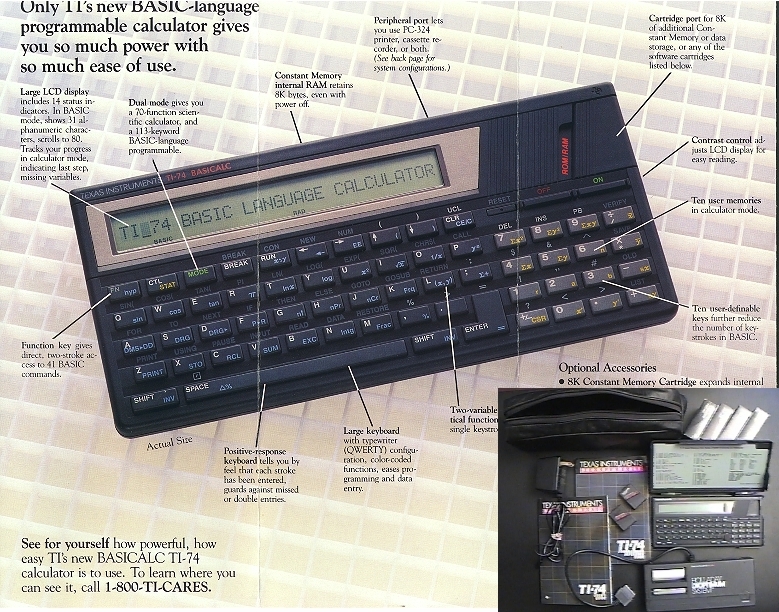 Picture of a TI-74 ad. See also TI-95. Picture of Comparisn Sheet. Comment This unit was also sold as the TI-74S for the Hamburg-Mannheimer insurance company (and others). The TI-74S lacks the labels for alternate key functions. The plugin module names RAM/ROM doesn't contain any RAM or ROM! It is just a cover for the contacts. It turns out to be difficult to list the contents of installable ROM packages. These are not listed in accessory sheet of the TI-95.